Should You Donate Money Using Credit Cards? The Salvation Army's red kettles are a familiar sight during the holiday season. You may have even dropped some change in one of the kettles at some point. Now, the organization is allowing people to make donations at many of the kettles using credit cards. The Salvation Army isn't the only charitable organization that accepts credit cards for donations. Even many churches allow credit card use for donations. But should you make charitable contributions using credit cards? Here are some things to keep in mind when considering whether or not to swipe a donation. Credit card use for charitable donations seems easy enough. You don't have to deal with cash or write a check, and you get a statement that shows that you made a donation. 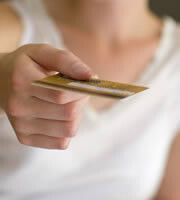 Credit cards even allow you to donate a sizable gift now and stretch out the payments over several months. But hold on a minute. Unless you have the money to give up front, it's a bad idea to donate money using a credit card. Not being able to pay off the balance of your donation when your bill comes can result in interest charges over time that can put you deeper into credit card debt. If you have high credit card rates and know you won't be able to pay off your bill when it comes, skip using your card to donate. Donating to charity shouldn't be a spur-of-the-moment event. It makes more sense to include a charitable giving plan in your budget. Determine how much you can afford to give each year, and choose organizations to support based upon that budget. Without a solid plan in place, you may end up donating more than you can actually afford. Do not give money to charities without a thorough background check. A lot of people claiming to represent charitable organizations are actually running scams. Never give out your credit card number to people who send unsolicited e-mails or call you, even if you think you recognize the name of the organization. Many charity scams are based around names designed to sound like legitimate organizations. Find out whether any group asking for money is a 501(c)(3), which means that it is recognized by the government as a tax-exempt charitable organization. You may be able to deduct your donation on your income tax return(please refer federal income tax brackets) When you do give money, you should receive a receipt from the charity that acknowledges your gift. 0 Responses to "Should You Donate Money Using Credit Cards?"